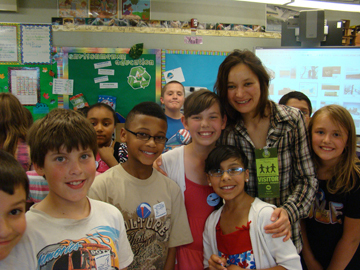 ICF colleague, Maria (Masha) Vladimirtseva, traveled from eastern Siberia (Yakutia, Russia) in late May to visit schools in Milwaukee, WI through Three White Cranes, Two Flyways, One World, an international education project coordinated by ICF and partners in China and Russia. Masha sent us a summary of her experiences during her visit, which highlights the similarities of students among the project countries and the importance of working together to achieve conservation goals. I visited ICF and Wisconsin schools again in the middle to late May 2010, for education activities, to tell about my country, Yakutia, the most northern part of Siberia, and the Siberian Crane, the third rarest crane species in the world and one of the “Three White Cranes.” Last time I visited American students in 2007, and we worked jointly with Chinese educator, Kang Yun. During this first visit, I was excited by the openness and the interest in China and Siberia that we saw in the Wisconsin children. This time I was happy to communicate with American children again. I like their interest in a lot of snow in April and permafrost – ice under soil – that they saw in photos in my presentation about Yakutia. They also were surprised about the polar day during all summer and a polar night during total winter. It was unusual for them that people in Yakutia can spend winter just wearing fur clothes, otherwise it is too cold! I brought some Siberian Crane art from Yakutian students that they prepared specially for American students, and some letters for them, and when I went to Yakutia I had with me many pieces of crane artwork from American students! When I visited Chinese schools together with educator Zhang Juan in 2007, I brought some art for Chinese children from Yakutian students, and then Chinese students presented their art for Yakutian students! So, we have an art exchange between the Three White Crane countries. I noticed American and Yakutian children draw similarly, and also they have the same questions and reactions during my crane presentation. Everyone thinks scientists should use a net to capture a crane chick! Actually they use a helicopter’s powerful wind to push a chick down to the ground, but it is difficult to guess! American students, as well as Yakutian, could not guess how many years a Siberian Crane can live. It is hard to imagine that they can live almost as people do! About 70 years! But there was the one small girl in a Milwaukee elementary school, and her question was the best I have ever heard. She saw the photo with Siberian Cranes captured in China on transit stop, living in no good conditions, just for people attraction. They will never be able to incubate eggs and raise chicks in such a tight cage, together with other captured cranes, swans and geese. And this girl asked me: “If we could to do something to help these cranes to release, to be free again?” She wanted to do something to help cranes, she believed she is able! We should develop the same sense that we can do something to dissolve any problem! We should speak about conservation problems and discuss what we can do together, and every child can help with his/her own information which could be expressed with Crane Art. The more people participate the more they are powerful! ICF researchers tracked four Black-necked Cranes banded with satellite transmitters as they migrated north this spring in southwestern China. The four Black-necked Cranes, along with a fifth crane whose transmitter stopped functioning in mid April, were banded by ICF and Chinese partners in early 2009 (2 birds) and 2010 (3 birds). The three cranes banded this winter migrated approximately 180 km in early May from their wintering area at Napahai Nature Reserve, Yunnan Province to their summering area on the western edge of Haizishan Nature Reserve in Daocheng County, Sichuan Province. The final crane, which was banded in winter 2009 and was tracked for over a year, stopped at the Haizishan Reserve and then continued north through Litang County to the border area of Baiyu and Xinglong Counties. This crane left the wintering area in early April and traveled 400 km to it’s summering area over a three week time period. 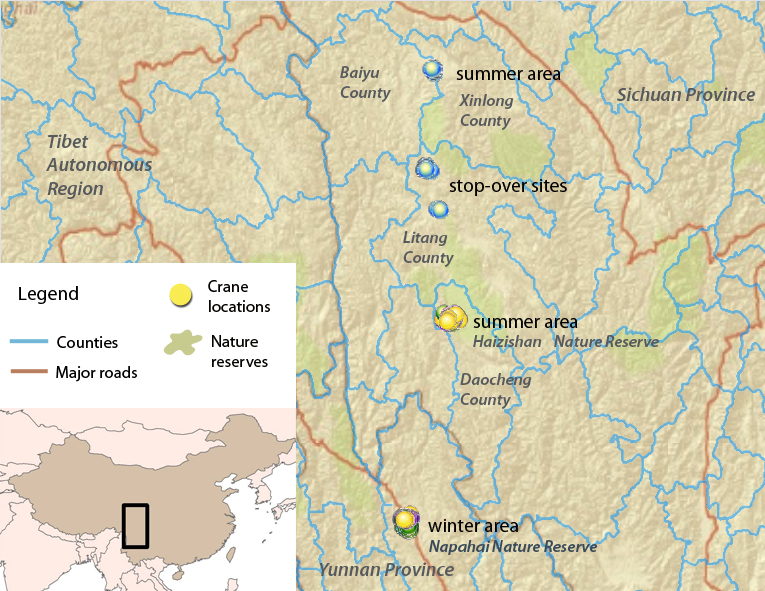 The location data from the banded cranes confirm data collected last spring, when researchers first identified these two new summering areas in Sichuan Province. ICF partnered with the China Exploration and Research Society, Kunming Institute of Zoology of the Chinese Academy of Sciences, Napahai Nature Reserve, Shangri-la County Forestry Bureau and National Bird Banding Center of China to complete the banding and migration study. We are excited to announce the release of the final report for the UNEP/GEF Siberian Crane Wetland Project (SCWP), a seven-year project coordinated by the International Crane Foundation focusing on the flyways of the Critically Endangered Siberian Crane in Eurasia. 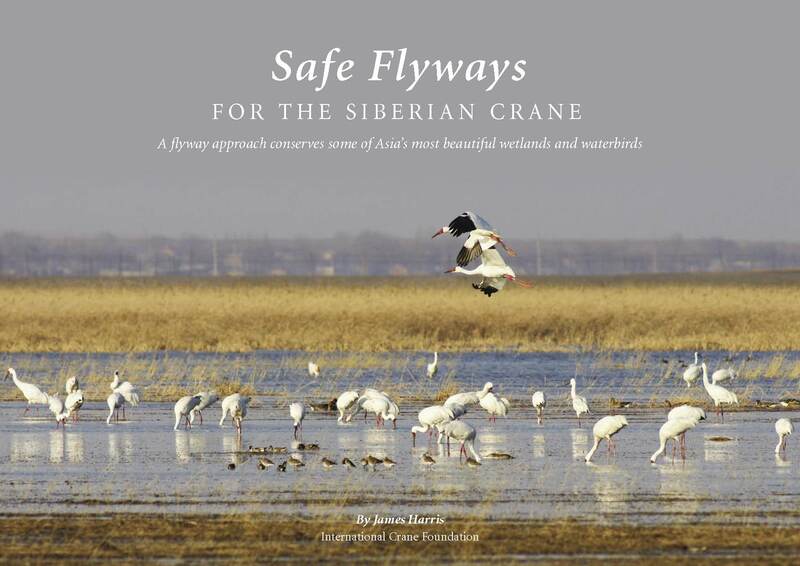 The 114 page, full-color report, Safe Flyways for the Siberian Crane, overviews the history of Siberian Crane conservation and details the achievements of the SCWP in China, Iran, Kazakhstan and Russia. To learn more about the SCWP and download the report visit the SCWP website at www.scwp.info. The 2008/2009 Annual Report for the One Helps One Program is now available. The One Helps One Program promotes education for young women in rural China by pairing students in need with a sponsor, who through an annual donation of just $20.00 helps cover the student’s school expenses. 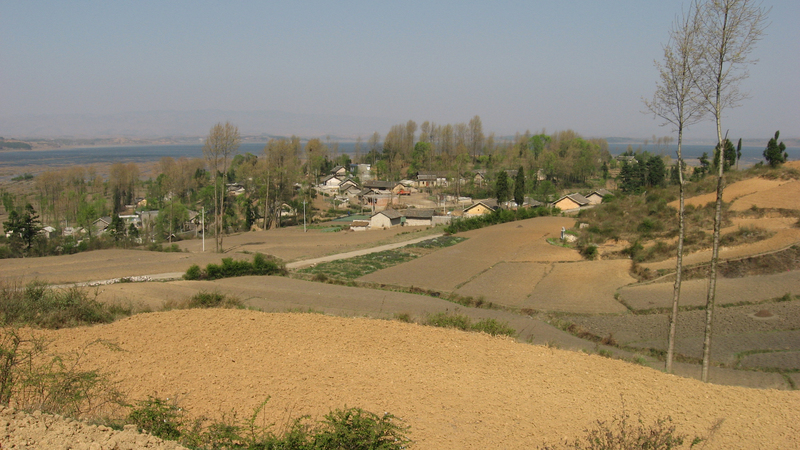 In 2008/2009 32 students were sponsored through the program, which is coordinated by the International Crane Foundation and Cao Hai National Nature Reserve in southwest China. Click here to learn more about the program and download the full report. In 2003 the International Crane Foundation, in collaboration with the governments of China, Iran, Kazakhstan and Russia, launched the UNEP/GEF Siberian Crane Wetland Project (SCWP). The six-year project focuses on a network of globally important wetlands in Eurasia that are of critical importance for migratory waterbirds and other wetland biodiversity. The project uses the endangered Siberian Crane as a flagship species, linking activities at 16 key wetlands along the species’ western and eastern flyways. Maximize the sustainability of key project outcomes through measures such as mainstreaming budgets for protected area management, developing partnerships, disseminating information, promoting replication of best practices, etc. Leverage additional co-financing to promote the sustainability of key outcomes. To learn more about the SCWP and our extension activities visit the SCWP website. We wanted to follow up our last blog posting on the Three White Cranes art exhibit with a few images from the exhibit opening last month. We hope that you can join us at the International Crane Foundation (ICF) this summer or fall to view the exhibit first hand (and for those of you that cannot make it to ICF, we hope you enjoy these images and consider hosting the exhibit at your school or city – see our previous posting on how to involve your school in this activity). Are you looking for something fun to do this summer? Starting next week the “Three White Cranes, Two Flyways, One World” art and education exhibit will open at the International Crane Foundation’s headquarters in Baraboo, Wisconsin. The exhibit highlights the achievements of the Three White Cranes project and includes artwork created by students in the United States, China and Russia, along with information on our project activities, education resources developed through the project, and a video focusing on the Xianghai Middle School Nature Art Club (click here to learn more about the Xianghai Middle School). The exhibit will open on June 20, 2009 and will show at ICF through October 31, 2009. The ICF Conservation Education Department is preparing a traveling version of the exhibit to show at project schools and other public locations this fall. Please contact Joan Garland, ICF’s Outreach Coordinator, for more information and how you can involve your school.